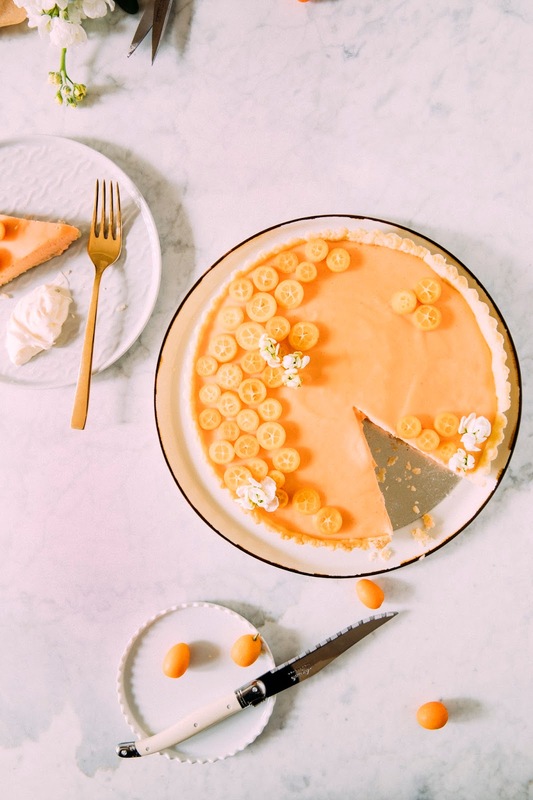 A few weeks ago, I started working on developing a lemon bar recipe for my book, Weeknight Baking. Do you know how many lemons it takes to make a batch of four recipes' worth of lemon bars? The answer: A LOT. I purchased a pound or so at my local grocery store, and was dismayed that I kept having to go back to buy more. Finally, I caved and just bought 10lbs worth at Costco and after doing so, and after about my eight batch from scratch, I eventually realized that I actually hate lemon bars (they're equal parts too sweet and too sour for me) and wound up scrapping the recipe from my book entirely. Now I have 10lbs worth of lemons in the kitchen, go me. The sensible thing to do would be to make a dessert for this blog (like these really cute mini lemon pound cakes with beet glaze, or this ever-popular passionfruit and blueberry cream tart) with all those lemons, but then I got lured by all the other citrus on display and bought more of those instead. Specifically, the cute little kumquats and what I thought were blood oranges. Imagine my surprise when I cut into one at home and discovered I'd been tricked — I'd actually bought pink grapefruit instead! As I was placing them in my basket, I knew that they seemed too big to be blood oranges, but the sign behind them claimed otherwise. And who was I to question the supermarket gods? 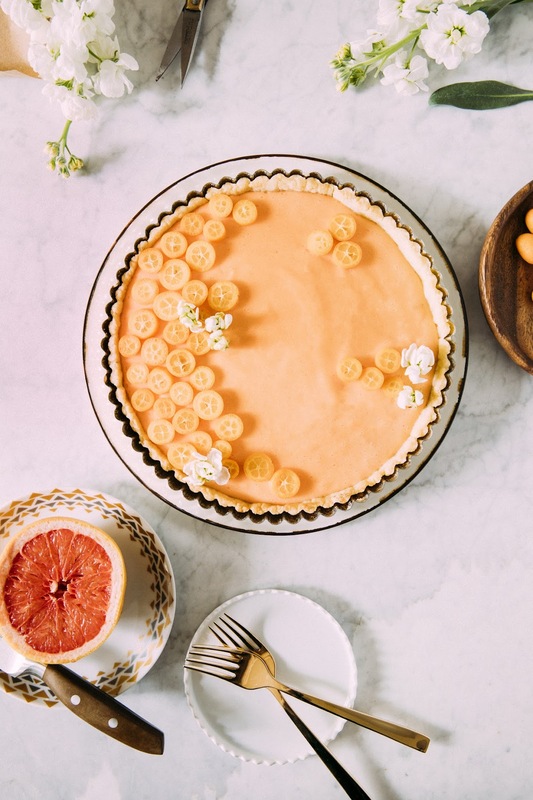 So here we are today — what was supposed to be a blood orange creamsicle tart is now... a grapefruit cream tart. My supermarket flub actually worked out fairly well in the end! I think blood oranges would have been too sweet for the cream recipe (which is adapted from this lemon blackberry tart recipe from yesteryear and also makes an appearance in these lime meringue tartlets and the previously mentioned passionfruit tart), since I literally just swapped out lemon juice for grapefruit juice instead. 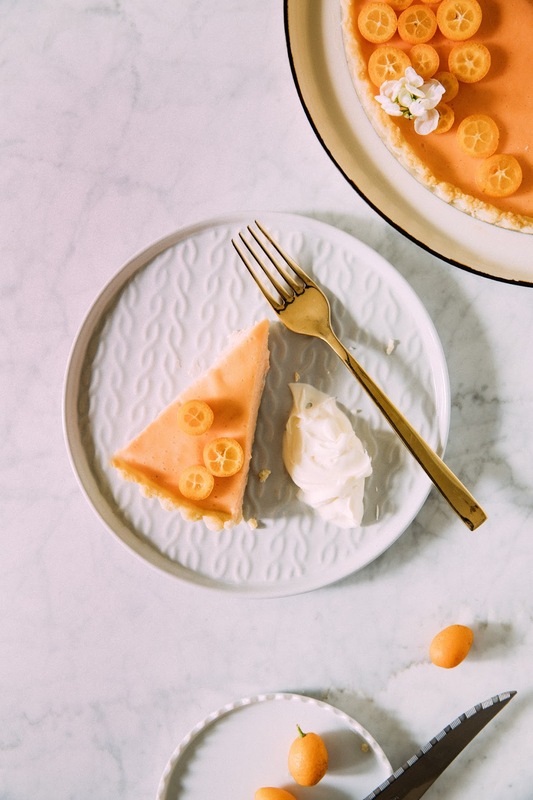 Because grapefruits are sweeter than lemons and I didn't reduce the original recipe's sugar quantity, the grapefruit cream is a just a touch on the sweet side (I mean, I like it, but I have a pretty big sweet tooth so it works well for me). 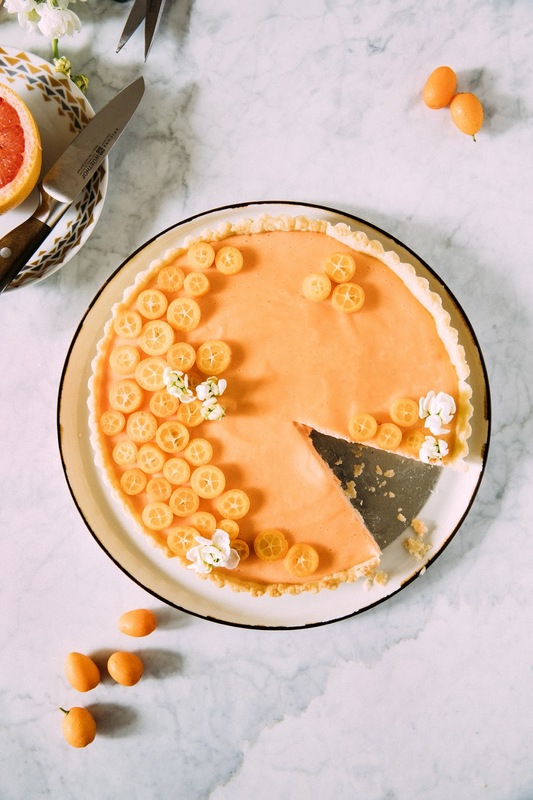 I ended up topping the tart with sliced kumquats, which adds a tart flavor to each bite to temper the sweetness. Enjoy! This recipe requires a handful of special equipment: a digital candy thermometer, an oven-safe glass bowl, and a blender. You'll need to cook the curd to specific temperatures to get it to set properly; you can probably wing it without one and cook the curd until it thickens enough for a whisk to leave a trail behind, but it can be touch-and-go so I really recommend sourcing a thermometer instead. The glass bowl will be baking in the oven at a relatively high temperature, so be sure to source a high-quality brand like Pyrex for the task. As for the blender, it's not actually necessary, but it'll make your life a lot easier and your filling a lot smoother. You'll need the blender to help incorporate the butter into the grapefruit curd; in a pinch, you can use an immersion blender (which is what I always used in the past iterations of this recipe, until I realized the filling came out much smoother in my high-powered blender) or manually whisk (but your arms will probably get reallyyyy tired). Although the crust is relatively simple to put together, it does have a tendency to crack here and there. Using European style butter (I recommend Vermont Creamery's) will prevent cracks since European butter has more fat than American butter. 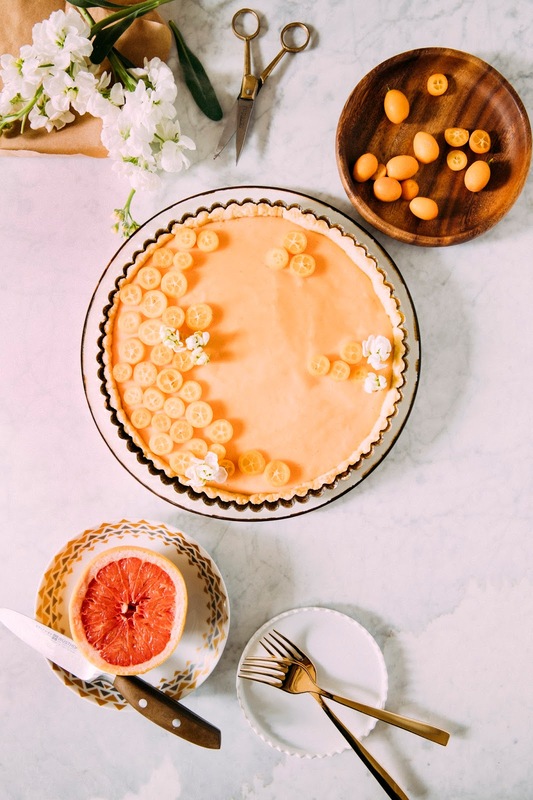 If you don't want to bother with sourcing European butter, simply reserve a pinch's worth of raw dough to spackle into any cracks when the tart is fresh out of the oven and cooling on a wire rack. There's no need to bake again — the residual heat from the tart will bake the new dough. I was disappointed to find that, after adding eggs to my pink grapefruit juice, the mixture turned into a dark yellow color instead of a pink one. I used a few drops of red food coloring to get it back to its pinker state. If you're opposed to food coloring, go ahead and omit it, but know that your tart will come out yellow rather than pinkish-orange like mine. In a medium ovenproof glass bowl, combine 6 tablespoons unsalted butter, 3 tablespoons water, 1 tablespoon grapeseed oil, 1 tablespoon granulated sugar, and a pinch of kosher salt. And now, this is going to sound real weird so you're gonna have to trust me, but transfer the bowl of ingredients to the preheated oven and bake for 15 minutes, or until the mixture is boiling and the butter has started browning. After 15 minutes, remove from the oven (but keep it on!) and immediately add 1 1/3 cups all-purpose flour all at once, using a heatproof rubber spatula to stir the flour into the rest of the mixture. As you do this, the mixture is going to bubble and smoke, so watch out! Continue mixing until you have a dough that pulls off the side of the bowl and looks a little bit like a lump of mashed potatoes. Once the dough is cool enough to touch, transfer the ball of dough into an 8-inch tart pan with a removable bottom. Use your fingers and the back of your hands to flatten out the dough onto the bottom of the pan, as well as into its corners and sides. It's going to feel greasy and kinda unpleasant, but go with it. Once the tart dough has covered the pan completely, use a fork to poke several holes into the crust. Transfer to the oven and bake until the crust is light brown and starts to appear flaky, around 15 minutes. Remove carefully from the oven and transfer to a wire rack to cool completely before filling. Pour 2 inches of water into a deep, heavy-bottomed saucepan. Place over medium heat, and bring the water to a simmer. Combine 1/2 cup plus 2 tablespoons grapefruit juice, 3/4 cup granulated sugar, 3 large eggs, 1 large egg yolk, and a pinch of kosher salt in a glass bowl. Place the glass bowl over the saucepan containing the simmering water to create a double boiler, ensuring that the bottom of the bowl does not touch the water. Whisk gently until the mixture becomes very thick and registers 170 (F) on a quick-read digital thermometer. When the mixture reaches 170 (F), remove the bowl from the sauce pan and transfer to a wire rack to cool to 140 (F), whisking gently from time to time in order to release the heat. Once the mixture reaches 140 (F), transfer to the bowl of a blender. With the blender on medium speed, start to add a few cubes of the butter into the mixture. Blend well after each addition of the butter pieces, making sure the cubes are fully incorporated into the mixture before adding the next few pieces — the sound of the mixture will change, going from a bumpy sound to a smooth sound as the butter gets incorporated. Once the butter has been fully incorporated, add a drop or two of red food coloring and blend just until the mixture is a homogenous pale orange color. 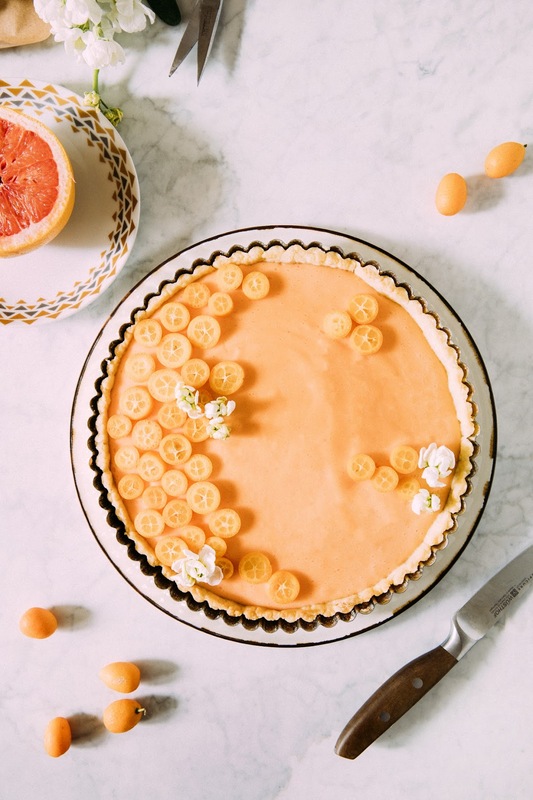 Use a rubber spatula to scrape the mixture out onto the prepared tart shell, smoothing the mixture across the shell evenly. Transfer to the refrigerator to chill for 1 to 2 hours before serving. During this time, the curd will solidify slightly and take on a texture similar to room temperature butter. Garnish with sliced kumquats before serving chilled.